What is Case & Carton Flow Rack? What are Carton Flow Racks, Pick Modules and Pick-to-Light Systems? 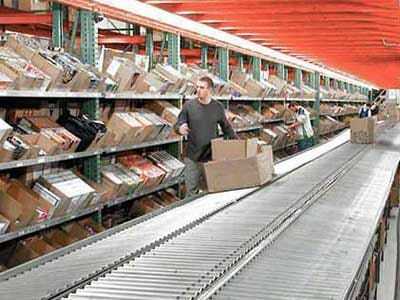 With case flow rack or carton flow rack, merchandise is stocked in the rear of the carton flow rack and moves toward the picking station in front on an inclined shelf equipped with specially designed roller track. Specific products are assigned to each lane. As items are picked, the next item slides down to take its place at the face of the racking. Everything works using rollers and gravity without motors or electricity. Pick module systems utilize carton flow racks with roller track or span-track in conjunction with static storage or other storage systems. A typical carton flow pick-module system consists of two facing rows of carton flow rack with conveyor running down the middle. The conveyors are used for staging orders, take-away for finished orders, and also to haul away empty cartons. Pick-to-light systems are a picking process commonly used in warehouses to automate product picking in case and carton flow systems. 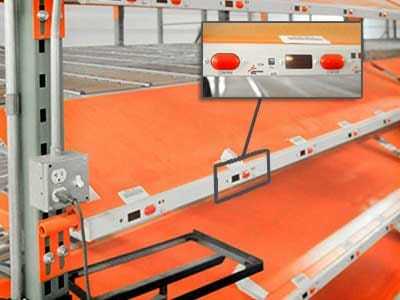 Pick-to-light systems use a light display process to mark shelves, directing the picking operator to the correct product location without having to rely on printed lists. As part of an Automated Storage and Retrieval System, pick-to-light systems greatly aid in supply chain operations to help improve productivity and accuracy for efficient picking in fulfillment operations. Restocking and picking typically offer the greatest opportunity for improving efficiency with labor savings shown of up to 75% almost immediately. Because items are picked from the front and stocked from the rear, both functions can be performed without interference and with minimized travel. Put simply, the main advantage of case & carton flow rack is that merchandise remains better organized and easier to find/pick. In a static storage system such as standard shelving, the stockers and pickers are often doing a lot of unnecessary work, leading to decreased productivity. Although the static storage systems may be less expensive in the short term, in the long run they can cost you more than they initially save, especially compared with a flow rack system. SJF currently has carton flow racks, spantrack, pick modules, and other warehouse storage racks available from most every major manufacturer. These racks are in-stock and ready for immediate shipment to you. Can't find what you're looking for? Call us at (320) 485-4974 (direct sales line) or (800) 598-5532 and we can help find it! In a traditional static racking system such as pallet rack or bulk shelving (shown at left in Figure 9), the stocking and picking operations are often performed at the same time. This often causes interference as well as a lot of time wasted in travel. With a dynamic system such as gravity flow, carton flow or spantrack (shown at right in Figure 9), the stocking and picking operations are kept separate to keep interference to a minimum. A carton flow rack system can also help keep inventory better organized and can help with inventory concerns as all products and quantities are immediately visible. This allows inventory control specialists to keep track of product counts, shortages and other inventory concerns. 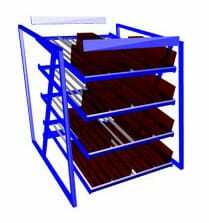 Like pallet rack, carton flow rack is modular and consists of many individual components. Units can be strung together utilizing 'starter' and 'adder' sections to create entire rows of carton flow storage. There are also several distinct types of carton flow frames and shelves that can be utilized in a variety of situations (see figure 11). The most common types of carton flow frames are square front and layback. Square front carton flow frames are useful for picking full cases. Applications include canned goods, liqour, parts, etc. Layback carton flow frames are useful when picking from open cases. Applications may include health & beauty products, books, or other situations where the cases are differently sized. Another advantage to layback frames is that it is easier for workers to access the middle and lower shelves. This is typically where you'd store your highest turnover merchandise, thus creating faster and more efficient picking. There are also several different types of carton flow shelves that assist in different picking applications. Straight shelves are the most common type of carton flow shelf, and are most commonly used when picking full cases. Knuckled shelves are the second most common carton flow shelf type and are useful for picking individual items from the cartons. Weld-in trays are similar to knuckled shelves but provide a larger access space from which to pick items. Finally, reverse knuckled shelves are useful for split case picking when the items are picked from the front of the cartons. Roller track is at the heart of carton flow rack's operation. It is on these tracks that the actual product (in cartons) rolls forward toward the front of the rack. Typically, these rollers are used in pairs to form "lanes" in each carton flow shelf. These lanes keep similar products separated. Shelf guides work with the roller track to keep product separated. The guides are placed between lanes to keep products rolling in their specific lanes so they do not cross over into other lanes on the carton flow shelves. Carton flow clips hold the carton flow shelves to the frames. Some of these clips can also be used with regular pallet rack frames to allow you to create a mix of carton flow rack and pallet rack in the same vertical space. Carton Flow Rack can be used either as free standing units or as part of a system in conjunction with conveyor, static storage, and multi-level mezzanines. A typical pick-module layout is shown here in a cutaway view. 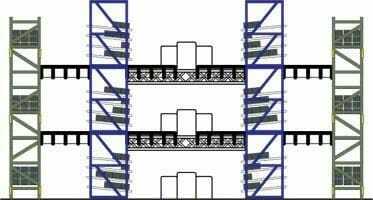 This multilevel system consists of two facing rows of carton flow rack with conveyor running down the middle. Pallet rack is placed behind the carton flow aisle for restocking. The conveyors are used for staging orders, take-away for finished orders, and also to haul away empty cartons. In an alternate version of this layout, (see figure 10, Layout 1) pallet rack can be placed over the rear of the carton flow rack, offering additional storage directly above the carton flow rack. To support the additional weight, pallet rack posts replace the standard carton flow posts and beams are substituted for sway braces. Pallet storage over the flow storage can also be used to achieve two and three tier storage systems. Figure 10, Layout 2 shows a combination of pallet rack and carton flow supplying product of varying volume to pickers at a central conveyor aisle. Orders move away from the flow rack and enable pickers to continue order selection. Figure 10, Layout 3 demonstrates a layout where fast moving items are stored on main picking aisles for easy access and maximum picker productivity. Restocking occurs from the center aisle without interrupting order picking flow.